American Railroad models - RTR league of excellence? I have 'some' american ready to run models, made by different companies, and given that I have no knowledge of the american scene, I dont know which one would be considered 'better' or more accurate than another. Given that there are so many manufacturers of USA stuff, is there an understood league of excellence in the standards that they work to/offer to the punter? I have locos from Walthers (Hobby Quality, Proto N) and Bachman, and I have box cars from Inter Mountain and Bachman (premium silver series) with a couple of Atlas Trainman hopper cars. all of these have been bought on the basis of price and appeal (The Bachman GP50 was bought on the basis that £25 makes it appealing...) and I am frankly astounded at the high level of detail that each item exhibits. I'm aware of, but not knowledgeable about, the fact that manuafacturers themselves seem to produce different 'grades' of products, and I'm interested to know if that 'grading' can be readily extended across different manufacturers. Over to you lot with lots of stock and an understanding of the american modelling world. ps - I'm also amazed at the running qualities of the locos; particularly the GP50. £25 for a superbly smooth slow running loco? How can you say no? Re: American Railroad models - RTR league of excellence? Having reached Spookshow's site, go to the section 'Model railroading' and search as you feel so-inclined. Spookshow's assessments are of course subjective, but he has a large international following and is highly-regarded. "TVR - Serving the Northern Taranaki . . . "
Don't have any Inter Mountain or Walthers stuff myself Donald as they don't really do the sort of thing I am after (and being a tight Fifer they are too expensive for me ). I've owned Atlas, Kato, Life Like, Bachmann (USA). Kato and Atlas do operate as their reputation suggests...very smoothly and they are usually very nicely detailed. That being said, I love Life Like. I get the best pulling power out of their stuff and they seem to be more forgiving of my questionable track building skills. For the money, I LOVE Life Like. My E8 and Gp18 pull like absolute monsters, and an E6 and PA that I owned were equal to those two. My Sw9/1200 Switcher is very detailed and runs nicely. I second what was mentioned - check out Spookshow International. 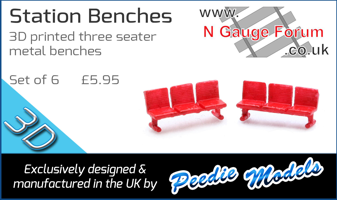 His site is brilliant for N Scale reviews. Spend as little as possible on what you need so you can spend as much as possible on what you want. The bulk of my American engines are from Bachmann, although I do have a couple of Lifelike and Atlas ones. Atlas engines are very quiet. My US Steamers are all Bachmann Spectrum and are superb runners. I have a couple of the cheapo £25 ones and they are good runners as you say and at that price who can argue with that. My rolling stock is a mix of Bachmann, Atlas, Trainman, Concor, Likelike and Rivarossi. All have their own scale regarding details. The older stock is so so but the more recent releases are very well detailed. I think the model companies know that their customers expect a certain level of detail and at a reasonable price. If you don't ask, you'll never know. I think if you're buying new there really isn't anything bad out there and ranking them would be tough, I have examples of most manufactures and have found them at least as good as the British stuff and in the most part significantly better. Kato stands out the most more me regardless of vintage, they run like Swiss watches and have a really well engineered feel to them. You mentioned Walthers / Proto, I have an 0-8-0 and an 2-8-4 and both are stunning in both detailing and running. Unfortunately Walthers seems to have abandoned N Scale of late and haven't realised any new locos or rolling stock in years. In terms of rolling stock Micro Trains stands ahead for me, the detailing is exceptional and I love the collectability of them. For Passenger cars Kato are again excellent. Agree as others have said the spookshow is the place to check, If I buy anything (especially second hand) I'll always check out Mark's review first. I've owned quite a few US loco's and found 99% of modern (made in the last 10ish years) model loco's are great runners, a duff American loco is rare thing ! Some may question why Kato isn't first... that's because two of my Kato loco's were a bit noisy, they ran beautifully but sounded a bit winey. Atlas is first because each and every one ran perfectly out of the box (from new). The best loco for me was the Atlas GP7, pretty much the best loco i've ever owned including all the various makes and gauges i've had over the years. If it's got rails... you have my full, undivided attention - Steam, diesel and electric, 'tis all good ! That being said, I love Life Like. I get the best pulling power out of their stuff and they seem to be more forgiving of my questionable track building skills. ...and if you want to convert to dcc, get the chassis machined - don't sit there with a big file (I can't say the correct word for it... ) trying to file it... it takes ages !!! I think if you're buying new there really isn't anything bad out there and ranking them would be tough, I have examples of most manufactures and on the most part have found them at least as good as the British stuff and in the most part significantly better. In agreement here. I rarely buy on manufacturer. Looks, Needs, Price - well that's the theory. My recent purchases of late have been mainly Kato with some Atlas. From dealing with guys in the US Atlas, InterMountain then Kato seem to be the favoured brands for locos with MT or Athearn for cars. Had the odd duff unit in all brands but overal satisfied with all my stock. Living 'over here' I'd have to say from going around the shops that the Kato and Atlas locos seem to be the highest quality wise......and when it comes to rolling stock you might want to have a look at Micro Trains. I can't speak about the steam locos, but for me,the best diesels by a country mile are Kato. They are the reason I gave up modelling British railways altogether, because even the best Dapol or Bachmann British loco fares poorly against a bad American loco, even after a period of running in. Kato are the best for me, followed by Atlas. These locos have a lovely slow speed, and are excellent for switching (shunting). Don't discount their discounted range either! Atlas Trainman locos are cheaper because the detail is allegedly not so good, but they are fine locos. Fox Valley Models make some nice diesels and I have a couple of their Norfolk Southern heritage scheme locos. One manufacturer often overlooked is Athearn. I started with an Athearn loco around eight years ago, and I still love that loco today. Smooth and quiet. Then we come way down the list to my poorest loco, a Bachmann Spectrum SD45. I only paid £30 for this from Hattons and at first it ran really nicely. But after five years, and numerous attempts at servicing the loco, I have reached the decision to model a partially scrapped loco at the depot, and the Bachmann one fits the criteria. What a heap of junk! Stock wise, I always like Microtrains the best. Having spoken to their excellent customer services on the phone as well, this company's products are superb. Atlas is again high in the rankings with stock, and I also like Intermountain cars. thanks for all the input guys. I look forward to reading through these when I next get a shot at a big screen. I foresee a future world of further expense. that spook show site sure is a labour of love! I could be lost for days in that web site! Don't be disheartened about the Bachmann loco. You may have a loco that bucks the trend, and actually is a gem. It can happen! Page created in 0.123 seconds with 45 queries.